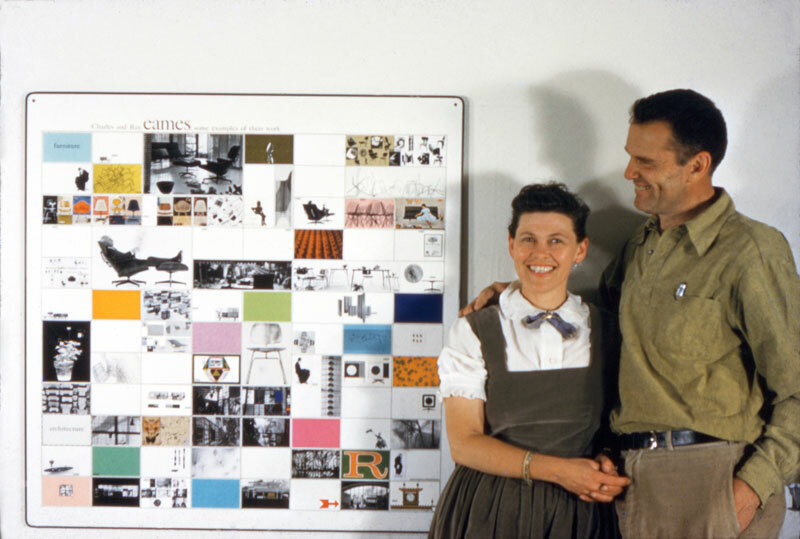 It is hard not to see the story of Charles and Ray Eames as a Californian dream. With little in their pockets beyond a small loan from the architect Eero Saarinen, the newly married couple arrived in Los Angeles in July 1941 in a black Ford convertible, having left their jobs and studies at Cranbrook Academy of Art near Detroit. After two months living in a hotel in Hollywood, they moved into an apartment block in west Los Angeles designed by Richard Neutra, the city’s most celebrated modernist architect; the building’s other inhabitants included Orson Welles, Luise Rainer, and Clifford Odets. Charles got a job in the art department at the MGM film studios while Ray designed magazine covers and painted abstract canvases. They turned their spare bedroom into a workshop equipped with a home-made moulding machine and experimented on their own designs at nights and weekends. In 1943, they set up an office in a renovated garage near Venice Beach, where their business would remain until Ray died in 1988, 10 years to the day after Charles’s death. 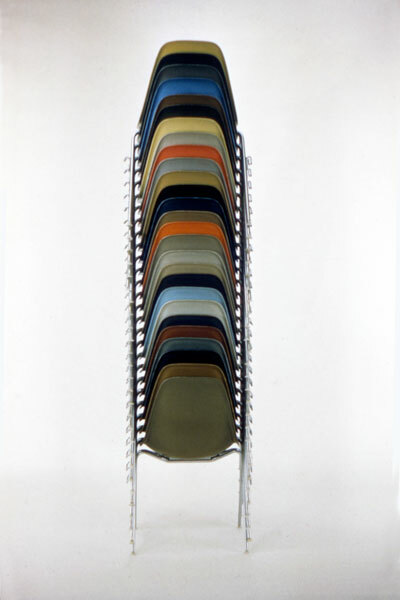 In the intervening four decades, the Eameses created many of the 20th century’s defining designs, including 25 furniture product lines, 19 of which are in MoMA’s collection and 17 of which are still in production. An array of their architectural plans, chairs, tables, toys, photographs, and films are now the subject of a retrospective at the Barbican in London (21 October–14 February 2016). It might come as a surprise, then, to discover that the Eameses’ relationship with Los Angeles was ambivalent at best. Indeed, the contradictions that characterised their feelings towards the city raise questions about the context in which we should view their work. By the 1940s LA had gained a reputation for being a home for modernist architecture, thanks largely to the white walls, immaculate lines, and expansive glazing of Neutra’s homes, as well as Frank Lloyd Wright’s warmer, Mayan-inspired designs. Yet the Eameses were attracted to the city’s quietness and lack of artistic activity. They wanted to concentrate on their own work. The idea that LA represented a haven compared with established art-world centres such as New York or London appealed to other cultural figures in this era. David Hockney, who first visited LA in 1963 and has subsequently spent much of his life in the city, admitted, ‘When I arrived I had no idea if there was any kind of artistic life there and that was the least of my worries.’ With its modernist pavilion set against a pristine blue sky, Hockney’s A Bigger Splash (1967) now represents a vision of stylish Californian escapism as seductive as any design by Neutra or the Eameses. 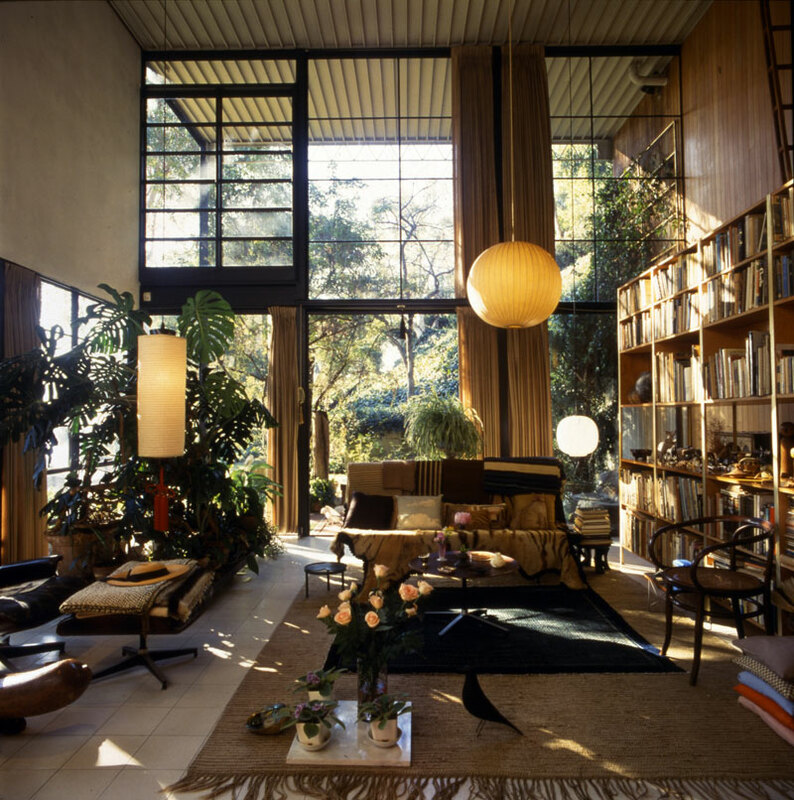 But Charles Eames’s emphasis on LA’s lack of ‘restraints’ and ‘constraints’ might appear odd given that experimentation and innovation are commonly associated with the furniture, houses, exhibitions, and films that the Eameses produced. What is more, one of the many myths clouding our impressions of mid-century LA concerns the freedom it provided for a generation of artists, designers and architects – many of whom were escaping conflict in Europe or the confines of an East Coast American scene increasingly dominated by Abstract Expressionism. Surely loosening constraints – open shirts, pool parties, glass houses – is what LA was all about? The work of the Eameses, though, can be seen as an investigation into the constraints governing materials and forms, and how complex ideas might be streamlined and communicated with clarity. LA’s unplanned eclecticism seems to clash with how the Eameses went about their multifaceted work with care and precision. Take, for instance, their famous moulded plywood lounge chair (1945), described by Reyner Banham in 1971 as ‘the most compelling artefact of its generation in some ways’, and labelled ‘chair of the century’ by Time magazine in 1999. The lengthy process undertaken on the chair’s design, honed through countless hours in the Eameses’ workshop and office, relied on restraints and constraints. How far could wood curve before splintering? Would the design withstand the demands of mass production? For all the painstaking research involved in the Eameses’ designs, the finished products are characterised by grace, ease, and fluidity. With the best of their furniture – such as the low, round coffee table (1946) or the plastic stackable chairs in perky colours (1955), or the lounge chair and ottoman – there’s a strong sense of organic design: it is as if they employ natural forms that have always been waiting to be harnessed in this manner. Notably, ‘never let the blood show’ was a favoured expression of Charles Eames. Less than 200 yards from the Eames House and screened from it by a row of eucalyptus trees stands Case Study House #9. Also built in 1949, this single-storey home was designed by Charles Eames and Eero Saarinen for the editor of Arts & Architecture, John Entenza, and is formed around a large horizontal glazed space for entertaining guests. Both Case Study houses grapple with the interactions between interior and exterior space, and between public and private lives – questions of domestic living that were particularly pertinent to LA architects at this time. Included in the Barbican show are new scale models of the Eames House and the Entenza House made by the British firm Rogers Stirk Harbour and Partners, a commission that stresses a lineage between mid-century LA modernism and the high-tech architecture that would emerge from the 1970s onwards. Elsewhere in the Barbican show, other aspects of LA culture can be detected in the Eameses’ work. 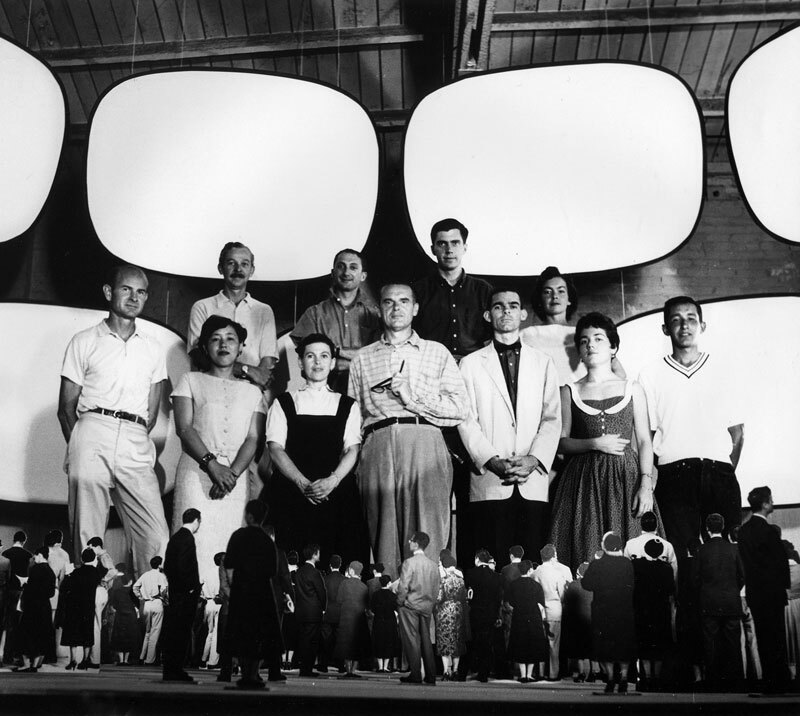 Glimpses of the U.S.A. is a remarkable 12-minute film that was initially shown across seven enormous screens at the American National Exhibition in Moscow in 1959 within a giant Buckminster Fuller dome. Seen by three million Soviet citizens, the work was designed to offer a glorified vision of American daily life via 2,200 fast-moving images. Among its standout moments is a sequence displaying aerial shots of freeway traffic that recall the development of Los Angeles, where the nation’s first freeway was built in 1940 and where the world’s first four-level interchange was completed in 1953. In both its focus on transport infrastructure and its lofty perspective, the sequence anticipates Ed Ruscha’s photographic series Thirtyfour Parking Lots in Los Angeles (1967), which captured the rhythmic patterns structuring LA’s auto architecture. Glimpses of the USA also features a clip of Marilyn Monroe winking at the camera, taken from the recently completed film Some Like It Hot (1959). 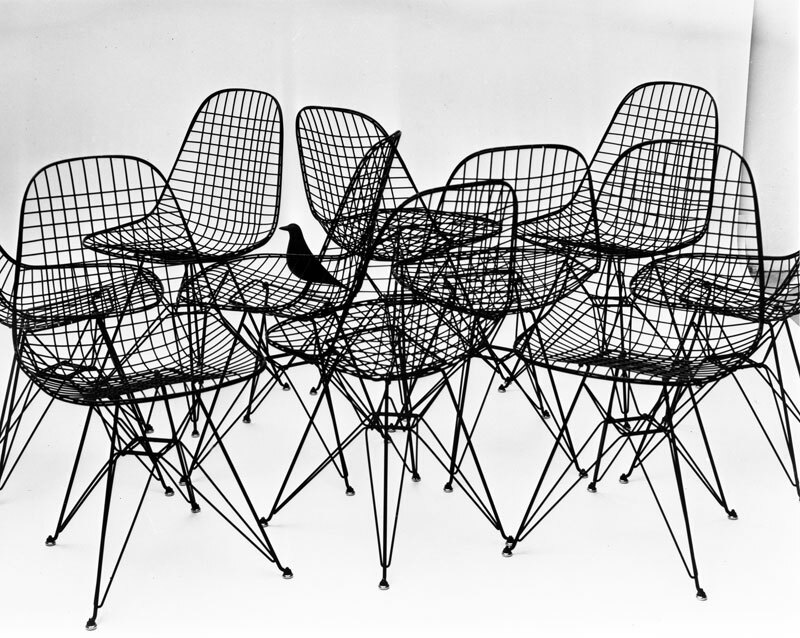 Charles Eames assisted its director, Billy Wilder (a long-time friend), on a number of shoots, and claimed he learned more about architecture from watching Wilder’s films than from talking to most architects. It is questionable, though, how much we can compare the Eameses’ broader film work, rightly emphasised at the Barbican and deserving of more sustained critical attention, with tendencies in Hollywood cinema. More tempting, perhaps, is to align their poetic treatment of on-screen objects, elliptical narratives and interest in immersive experiences with currents in LA’s rich tradition of avant-garde film, and key figures such as Maya Deren and Kenneth Anger. Yet, across their career the couple employed film for such varied purposes – to think about and to communicate ideas in a range of contexts – that a straightforward summation of their approach to the medium remains difficult. The Eameses’ contribution to the Moscow exhibition emphasises how their LA base became the hub for a design practice with a global reach. The work of the Eames Office included a longstanding consultancy role with IBM; a report commissioned by Jawaharlal Nehru into improving design in India; and the organisation of an international touring exhibition on American history for the nation’s bicentenary in 1976. The extent to which projects such as these can be considered as part of the specific development of art, design and architecture in Los Angeles seems dubious. As Pat Kirkham, a long-time chronicler of the Eameses, has observed, ‘sometimes it seemed that the Eames Office could be anywhere, so hermetically sealed off was it from the outside world’. For Catherine Ince, while ‘there’s a very strong Californian dimension to their work’, ultimately the Eameses ‘used LA for what they needed most: space’. At stake here is the relationship between place and design: how much should we associate the work of the Eameses with the specific geographical location in which it was produced? If this question is raised by the Barbican show – the title of which, ‘The World of Charles and Ray Eames’, implies both a tightly sealed bubble and an international legacy – it also opens up a much broader issue that has been explored in other recent exhibitions about post-war LA. In 2006, the Centre Pompidou in Paris staged ‘Los Angeles 1955–1985: Birth of an Art Capital’, in which the work of over 80 artists was surveyed in an attempt to show how LA joined New York, London and Paris on the world stage. Even more ambitious is the ongoing Pacific Standard Time project, which held its first exhibitions in 2011. Claimed by its organisers at the Getty Foundation and Research Center in LA to be ‘quite possibly the largest visual arts initiative ever’, it seeks to map across multiple Californian institutions how the region’s artistic life developed after the Second World War. Its 2013 displays and events on the history of modern architecture in the area inevitably placed the Eameses at the heart of the story. Reviewing the Pacific Standard Time project in Frieze, Sam Thorne noted that, ‘More than any other city, art from LA is remarkably still often understood as a primarily localized phenomenon.’ It is a comment that might equally apply to the city’s architecture and design history. Perhaps, then, now is a good time to question just how much we should instinctively connect the work of figures such as the Eameses with the wider development of Los Angeles. Critical restraint – avoiding those clichéd narratives of the Californian dream – might be one way to begin telling new stories about their achievements. 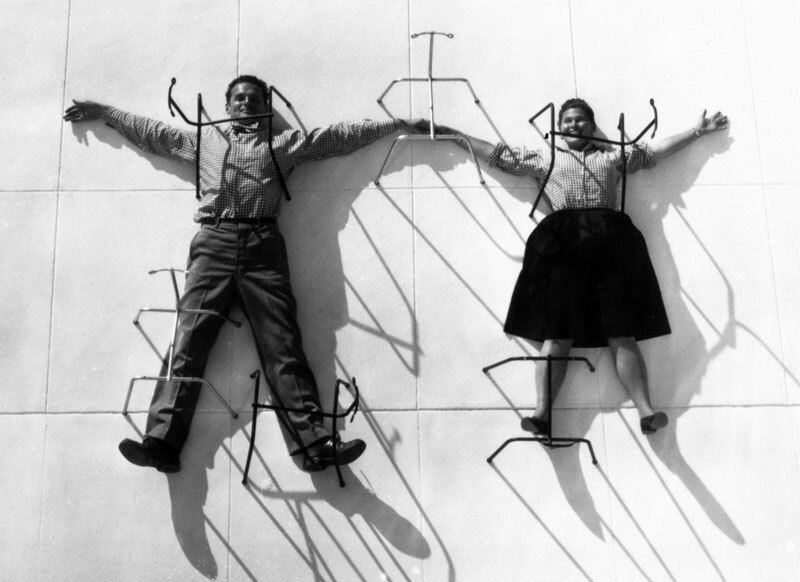 ‘The World of Charles and Ray Eames’ is at the Barbican Art Gallery from 21 October to 14 February 2016. Why rent a gallery when you can use your own apartment?